What is Scoopy-the-Poo? No, it isn’t Scooby Doo’s cousin, or even his nephew, brother, or uncle. It is a fantastic pet waste management product. I use it for my dogs’ poo and I can tell you that it is super easy to use and keep clean. There is no need to hose it off and get poopie splatters all over your shoes and clothes. There is nothing disgusting to touch or wipe down with a cloth. Just clip on a regular garbage bag, scoop the poop, remove the bag, tie it up, and put it in the trash. How easy is that? One dog can generate 50-60 piles of poop per month. I have two dogs so that’s twice as much poo! If you don’t pick up after your dog (or dogs), it’s not only gross, but unhealthy for both you and your pets. Not picking up after your dog kinda puts a damper on having a backyard barbecue, too. I guess you will be going to uncle Bob’s for barbecue instead and have to eat his overcooked meat. You won’t be able to get your kids to go outside and play either. There goes your peace-and-quiet for the summer. And let’s not mention what happens if you don’t pick up the poop before you mow the lawn – Yuck! So scoop the poop with Scoopy-the-Poo! Your dog will be glad that you do… Hey, that kinda has a nice ring to it. You could almost make it into a song! On Saturday, May 1st, 10:00am – 1:00pm, Camp Bow Wow in Olathe Kansas is hosting a great pet party. There will be games, food, and fun! Also, get $10.00 vaccinations per shot of rabies, distemper, and bordetella; or $25 micro-chipping. There will also be dogs for adoption, or a free bath with a donation to Animal Haven or No More Homeless Pets KC. Pet Auto Safety.com will be there too. We are supporting Animal Haven and No More Homeless Pets KC. We are also endorsing Camp Bow Wow as a great place to take your pet. And we will have our pet auto safety supplies available at 10% off. Thank you Camp Bow Wow for inviting us! Per the United States Postal Service, “In celebration of the new Animal Rescue: Adopt a Shelter Pet stamps, the Postal Service™, together with Ellen DeGeneres and Halo: Purely for Pets, is giving shelter pets around the country a First-Class Meal.” Visit http://www.stampstotherescue.com to buy the adorable Animal Rescue dog and cat 44¢ stamps. You buy the stamps, Halo buys the food for 1 million shelter pets. Photos of five cats and five dogs who were adopted from shelters are featured on these Animal Rescue stamps. We purchased our stamps. Help homeless dogs and cats by buying yours. It costs the same as other stamps, but you are not just buying stamps – you are buying lives. The United States Post Office has other Animal Rescue products which you can purchase to help homeless dogs and cats. These include mugs, coasters, and art. Other “Stamps to the Rescue” supporters include the Ellen Degeneres Show, Halo Purely for Pets, PetFinder.com, American Humane, AdoptAPetGifts.com, and the Humane Society of the United States. An Alaskan State Trooper was alerted to a fire but had a difficult time finding it through the winding roads. He saw a German Shepherd running down the street so decided to follow him. And the dog led him straight to the fire! check out this awesome vidoe on You Tube. And read more about the story at PawNation.com. Here are the answers to the puzzle posted on April 22nd, 2010. Insert a letter into the middle row to spell an AKC dog breed name across. The letter you insert may be at the beginning, middle, or end of the dog breed word. All dog breeds are one-word dog breeds. 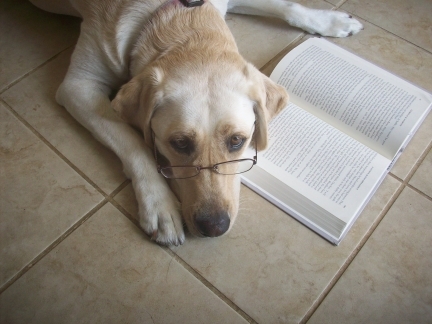 There are no parts of two-word dog breeds, such as Labrador for Labrador Retriever. Each letter of the alphabet, except Q, will be used only once. So look out for a row in which two different letters could be used to spell two different breeds. Please note that not all letters in the row across will be used in spelling out your dog breed. Also, there will be one AKC dog breed spelled out somewhere in the middle row down. Look out for the answers to post in a few days. Must Watch Through a Dog’s Eyes on PBS Tonight! Tonight on PBS at 8pm ET and 7pm CT, PBS is showing “Through a Dog’s Eyes”. “Through a Dog’s Eyes” tells the story of dogs raised to be therapy or assistance dogs and how they positively affect the lives of people in need. Please watch it! It is going to be a heartwarming story. Don’t forget your tissue. It is on PBS so you don’t have to have cable. For more information on this episode, visit http://www.pbs.org/dogs-eyes/film#. Training a dog is not always easy. But it doesn’t have to be too difficult either. By accepting and following four simple elements of dog training, you and our dog can have a fun and rewarding experience. The four most important elements of dog training are Time, Patience, Positive Reinforcement, and Consistency – or TPPC. Spending time training your dog does not mean hours a day every day. You only need to spend 5-15 minutes per day. Some dogs will catch on to a command such as sit within a couple of weeks while some dogs may take longer. But you don’t need to spend more than 15 minutes per day working on the command unless you can see that your dog is really focused on and enjoying the training. Spending too much time in one day could make both you and your dog bored or frustrated. In turn, boredom and frustration could inhibit the learning process. Training your dog requires lots of patience. Your dog may not catch on right away and that is okay. If you are impatient with your dog during training, your dog will be more concerned about not pleasing you than on focusing on what they could do right to earn your praise or a treat. If you are finding yourself getting frustrated, stop. Take a breath or two. Then perhaps get your dog to obey a few commands which he does understand in order to build his confidence. Or break down the command he is learning into simpler or shorter steps. With sitting, for example, if you are having difficulty in getting him to sit properly, praise him for any slight squat down, even if it is only for a split second. Try to avoid using physical punishment or force on your dog during training. Your dog will learn better if he wants to learn. And he is not going to want to learn if he is being punished. Learning should be fun for your dog so use lots of positive reinforcement such as praise and/or treats for good behavior. Training needs to be consistent. Try to practice a new cue at least every-other-day. Every day is best, but it is okay if you miss a day every now and then. When your dog has learned the new cue, you won’t need to work with him every day anymore, but you will want to have a refresher training session once in a while. Using TPPC in training your dog will go a long way in helping your dog learn their commands. So long as these elements are practiced, your dog will learn to look forward to training sessions so that he can have the opportunity to please you (and the opportunity to be given some delicious treats). A well-trained dog will make both you and your dog very happy together. It is Tornado Season again in the Midwest and other parts of the United States. As a follow-up to our post on Disaster Preparedness for Your Dog and Other Pets, we are giving additional tips on Tornado Safety for Your Pets. As in any disaster preparedness plan, know where your pets’ hiding places are so that you can locate them. Storms scare some pets so they may be in hiding. Keep a leash, crate, or other safe pet restraint handy so you can lead or carry your pet to the safe place. Know of a safe place within your home or around in your neighborhood where you can go in the case of a tornado warning. If the safe place is not in your home, but in your neighborhood, make sure it is a place which will allow your pets. The safest place within your home is the basement. If you do not have a basement, go to the centermost room or hallway on the lowest floor, away from any windows, and get under a table or other such piece of furniture. Over two years had gone by since our family dog, Missy, had died. We had been toying with the idea of getting another dog for some time, but it was difficult knowing that no dog could ever replace the joy that Missy had brought us. Every week, I would look through the section of the newspaper which posted photos of dogs available for adoption at the Humane Society. They were all very adorable, but it wasn’t until I saw Scooby that my consideration for a new dog went beyond browsing. Scooby was a ten-month-old Australian Shepherd Mix. He looked a lot like Missy, but was just enough different to be his own personality. After thinking about Scooby all day, I got off work early and called my husband to see if he was busy at work. He said he wasn’t too busy and asked if I wanted to do something. I asked him if he wanted to go to the Humane Society. He replied, “Do you want to go see Scooby?”. Apparently, he had seen the same picture in the newspaper and thought the same thing as I did. At the Humane Society, we found that Scooby seemed pleasant enough, but he was way more interested in sticks than he was in us. I also thought his face didn’t really have the same friendly expression that I had become familiar with in Missy. I think I was just thinking of excuses to not fall in love with this dog. But I went back a couple of times just to become familiar with him. Almost a couple weeks after our first visit, Scooby became a new member of our family. We changed his name to Mos Magee after a character on “The Office”. He is the greatest dog and I love him to pieces. He filled the hole that Missy left and also touched me in ways that only Mos could. He’s my special dog. People are ALWAYS asking what breed he is. 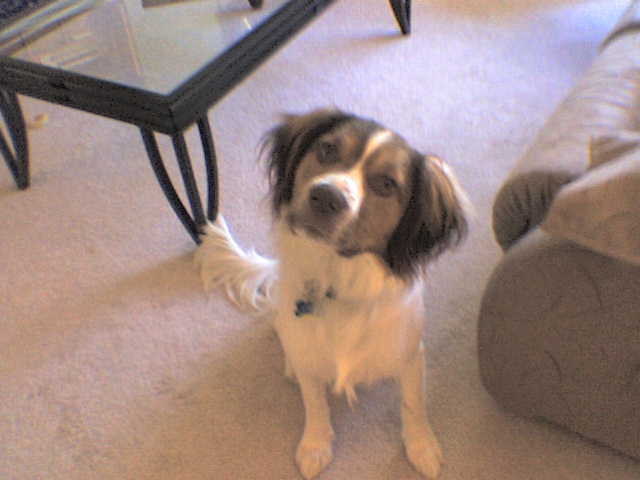 We think that in addition to Australian Shepherd, he must have some Springer or Brittney Spaniel in him. Some people have also said he looks like a Cavalier King Charles Spaniel. We don’t really know, all we know is that he is ours and we love him.